ENTRY DEADLINE EXTENDED: Last date of sending entries is now 23rd February! Let's celebrate love all through the month. On popular demand, we have extended the deadline by 10 days. So start sending your entries today without any delay! 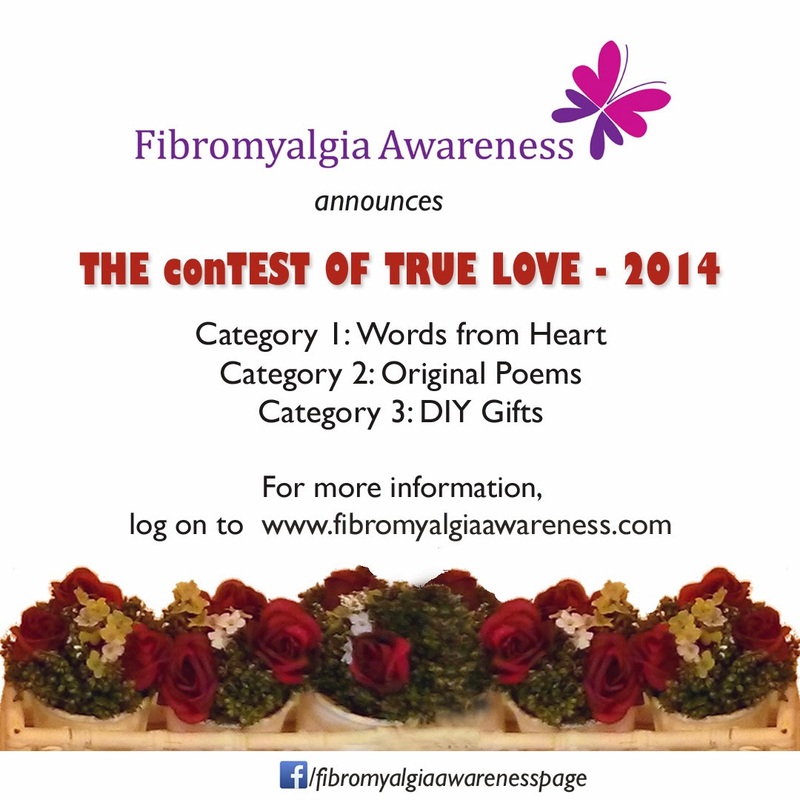 Inviting entries from Fibromyalgia Warriors for the second year of THE conTEST OF TRUE LOVE! Yes, a lovely contest just for those who have Fibromyalgia. It's tough for a person to deal with a loved one's chronic pain, inability to do some many things, mood swings and all the symptoms. Yet, they become our support system, our strength. We feel low so many times but we know they are there for us and we hold on to that good thought. We keep going with the power of that love. So take a few minutes and express your love to the ones who care! Tell the person/s how much you appreciate and love them for all that they do for you. Only members of our Facebook page, suffering from fibromyalgia, can participate (If you haven't joined us yet, you are most welcome to Like our page now). Email us [contact@fibromyalgiaawareness.com] your entry in one or all of the above categories. Only one fresh and original entry per category is allowed per participant. You must share your entry's link on Facebook and we shall look at the likes and shares you get. The contest will be judged by the Fibromyalgia Awareness Team. ENTRY DEADLINE: 13th February 2014, 9 pm (IST). You can check the corresponding time in your time zone here. Extended deadline: 23rd February 2014, 9 pm (IST). The winners will be announced on our Facebook page as well as the blog. The winners of all three categories will be featured on the home page of our blog for a month. One runner-up per category will be featured on the blog until mid March. Special mention to other lovely entries. So hurry up... pen your thoughts now and then spend a lovely Valentine's Day! Hugs! Check out Last year's Winners here.